"A new exotic way to flirt with your lips! Experience the fruity fragrance of peach while your lips shine and shimmer with a light coral glow. Long lasting hydration makes your lips deliciously soft and supple. 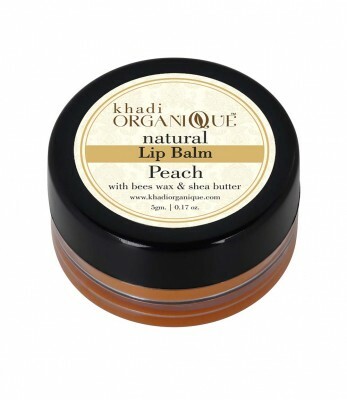 An adorable lip balm that melts on your lips from Khadi Organique helps to replenish, nourish and restore dry flaky lips. A luxurious formulation of Kokum, Coca and Shea Butter, it is enriched with essential oils and Peach and Apple extracts to give you extra soft, plump lips. Give your lips a fuller, youthful pout and shield from the harsh environmental elements. A must for your daily rejuvenating routine, enjoy the delicate fragrance while your lips regain their happy smile! "